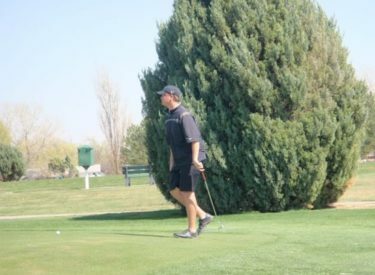 Guymon’s golf team must have enjoyed their afternoon at Willow Tree Golf Course in Liberal. The weather wasn’t bad with the wind laying for the most part until the evening hours and they were dominant in winning the Liberal Invitational. Guymon shot a 301 for first. Garden City’s JV shot a 334 and won a tie breaker with Liberal who scored a 334. Meade took fourth witha 353. Guymon’s Wong Sakron Pikunsawat won the tournament with a 74. Garrett Marler carded a 75 for second place. Mathew LeGrange shot a 76 for third and Guymon’s Tre Fankhauser shot a 76. Guymon’s Trent Nevola took fifth with a 78. Liberal’s Alex Colvin shot an 80 for sixth while LHS’s Zane Ralston carded 81 for seventh. Garden City’s Boston Parker shot an 84 for eighth. Austin Jansonius of Meade was ninth with 84. Blake Stout of Liberal was 10th with an 84. LHS goes to Garden City Saturday.